The JUMP2Excel: Joint Universal activities for Mediterranean PV integration Excellence consortium is organising a series of Public Lectures by top world leading research organisations. 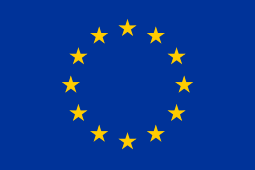 JUMP2Excel project has received funding from the European Union’s Horizon 2020 research and innovation programme under grant agreement No 810809. The Public Lectures series is organised in collaboration with The Malta Group of Professional Engineering Institutions (MGPEI) and The Chamber of Engineers (CoE). 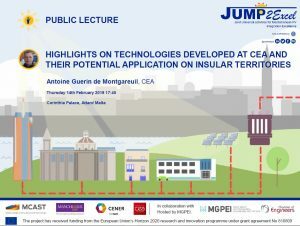 This series is being launched on February 14 17:45 at the Corinthia Hotel, Attard with a lecture by Antoine Guerin de Montgareuil from The French Alternative Energies and Atomic Energy Commission (CEA), hosted by MGPEI. His lecture will delve into the highlights on technologies developed at CEA and their potential application on insular territories. Antoine Guerin de Montgareuil is research engineer at CEA’s solar group since 1997. He is an expert in the measurement and the modelling and the prediction of the solar resource, the measurement and the modelling of the performance of photovoltaics, modules and systems, and the sizing of energy storage for photovoltaics in smart grids. In 1987, he had started-up artificial intelligence research at The National Institute of Research in Computer Science and Automation (INRIA) and recently participated in a collaboration with Météo France and French Laboratoire National d’Essais (LNE), he also participated to the accurate calibration of absolute cavity radiometers and of global pyranometers. Antoine Guerin de Montgareuil has been involved in many international and national research projects, including as an expert within the International Energy Agency. He is currently working in the domain of solar resource forecasting with the universities of the French overseas departments. The event is open to the public, free of charge and will be live streamed on JUMP2Excel Facebook page. An electronic Certificate of Attendance will be given after the event.